Self-confident, chic, modern. 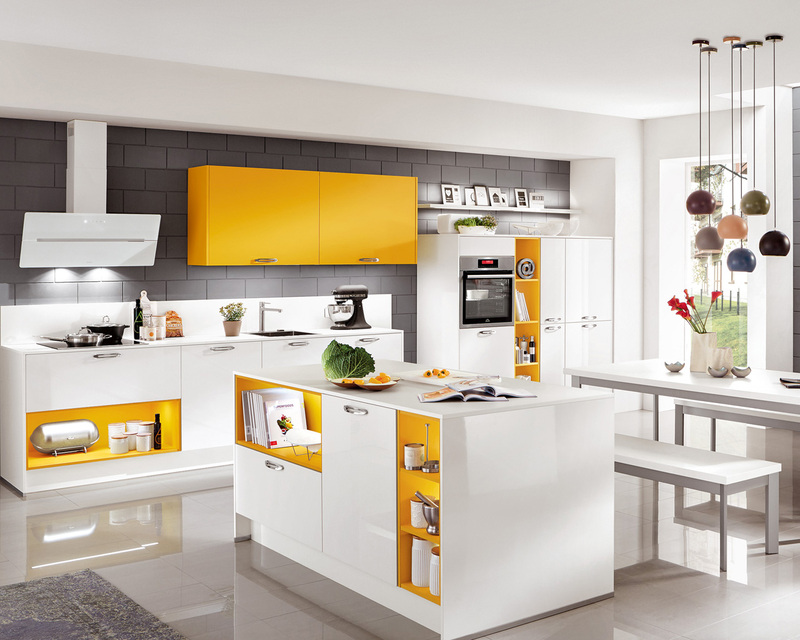 MODERN KITCHENS REFLECT THE HERE AND NOW. 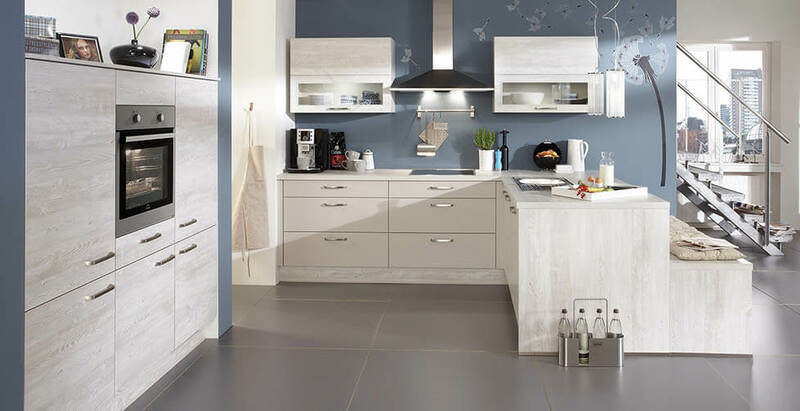 Regardless whether wood, lacquer or glass – a modern kitchen from nobilia convinces with its self-confident design, extravagant elements and high-quality equipment. The combination of the most varied materials ensures that modern kitchen are never boring and always have an eye on the future. A family-sized kitchen needs space – maximum space! Our base units in Maxi height are perfect for this! They are very versatile in their design use. Depending upon the physical size of the kitchen user, Maxi height can be used continuously throughout the room to maximise storage space. Alternatively, they can be combined with standard height base units in order to increase convenience and ergonomics in individually targeted active areas. Kitchen ahoy! This kitchen in trendy natural colour combinations gets a subtle maritime touch with Nautical pine reproduction and an earthy shade of Sand. The wood décor is convincing in its contemporary design, the White colouring is reminiscent of sun-bleached driftwood aged by wind and weather. The charm of this distressed look forms a fascinating contrast to the straight-lined look of the doors. The youthful, unconventional design is loosened up by the bench on the rear side of the breakfast bar. This is outfitted with full pull-outs to maximise storage space. 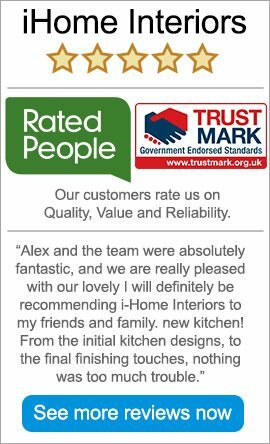 This design comprises of a trendsetting combination of supermatt TOUCH fronts in the colours Slate grey and Alpine white. This colour combination is systematically continued in the beautiful geometric Vector Art motif on the niche cladding and shelf unit back panels. In this design, Alpine white lacquer fronts combine stunningly with black glass and sophisticated Endgrain oak reproduction worktops and claddings. The lighting integrated into the Boulevard glass cabinets accentuates the glass segments and showcases the matt black Masterflow glass panel. Yellow is not just a mood lifter, this most beautiful of summer colours is also superb combined with pure Alpine white. The Maize yellow COLOR CONCEPT accents drive away every sad thought and conjure up a ray of sunshine – an instant dose of summer for your home. Handleless and systematic. 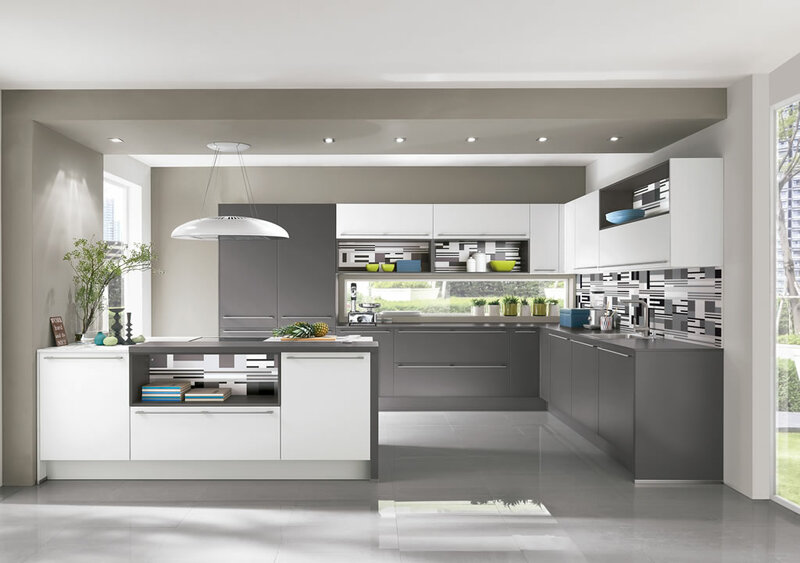 The range of fronts and units of the handleless LINE N kitchen system is notable for its great diversity. The selection encompasses a total of 37 modern fronts of high-quality workmanship and roughly 500 different kinds of units. The planned end of run for LINE N kitchens can be designed in a variety of ways using end upright panels or front uprights. With large door sizes, e.g. fridge/freezer combinations, it is recommended that the recessed handle direction run vertically – as in this tall unit combination – for ergonomic reasons. 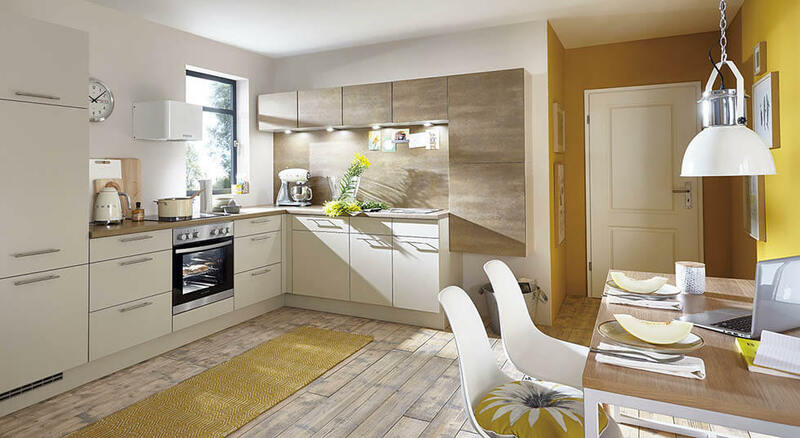 What makes our Nobilia Kitchens ‘modern kitchens’? Is it the dramatic contrasts or subtle highlights? Perhaps that the furniture can be adapted to suit your tastes, environment and also budget? Perhaps our extensive range of colours and door and drawer fronts invite almost endless custom combinations? 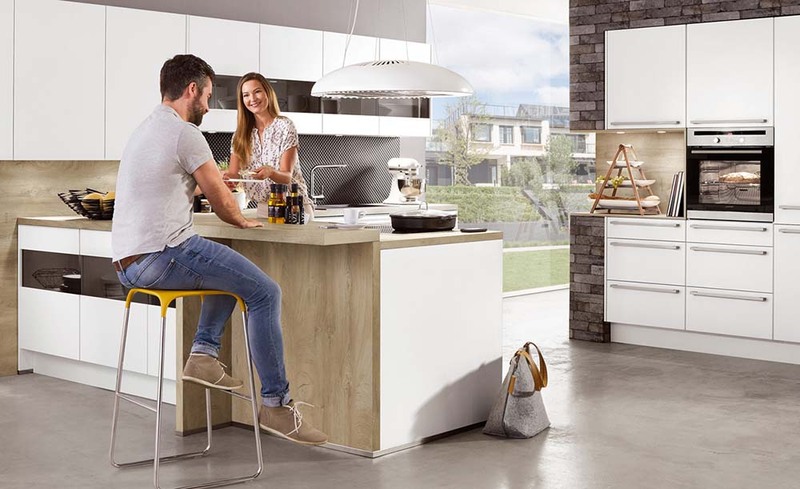 Perhaps it is all of these and more so here we have assembled what we consider to be a suitable insight into some of the Nobilia German kitchens that our customers have considered ‘modern’. 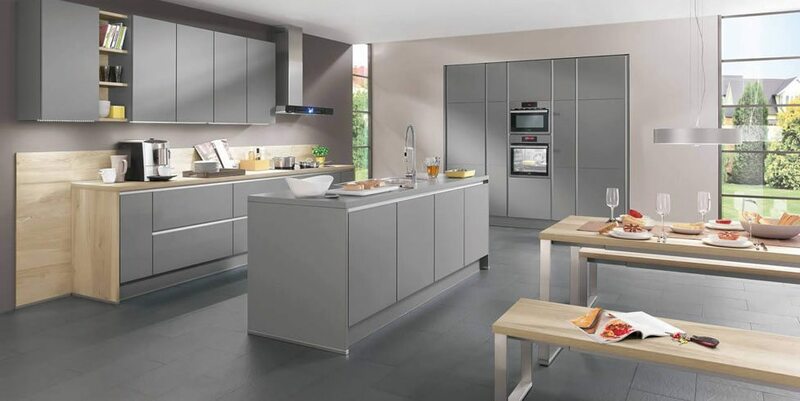 If you are interested in Nobilia for your new ‘modern German kitchen’, or any other of the interiors we design, supply and install, we operate across Buckinghamshire, London, Berkshire, Surrey, Oxfordshire, Hampshire and Hertfordshire and offer a FREE HOME DESIGN SERVICE.